The word arthritis actually means joint inflammation. The term arthritis is used to describe more than 100 rheumatic diseases and medical conditions affecting the joints, the tissues which surround the joint and other connective tissue. The pattern, severity and location of symptoms can vary depending on the specific form of the disease. 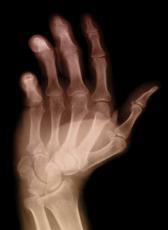 Typically, rheumatic conditions are characterized by pain and stiffness in and around one or more joints. The symptoms can develop gradually or suddenly. Certain rheumatic conditions can also involve the immune system and various internal organs of the body. The most common form of juvenile arthritis is JRA (the term and classification system used most commonly in the United States). JRA involves at least 6 weeks of persistent arthritis in a child younger than 16 years with no other type of childhood arthritis. JRA has three distinct subtypes: systemic (10%), polyarticular (40%) and pauciarticular (50%). Each type has a unique presentation and clinical course and immunogenetic association. For the latter two types, girls are more commonly affected. In all three types about 40–45% still have active disease after 10 years. For the systemic type, the peak age of onset is 1– to 6–years-old and about 50% of cases show very short stature in adulthood as a result. For the pauciarticular form, there are two distinct subtypes- early onset and late onset. Early onset is more common in girls, late onset is more common in boys. The genetics differ as do the clinical courses. In the polyarticular form, there are also two subtypes: rheumatoid factor (RF) positive and negative. RF positive usually effecting girls with onset 8 plus years age and a poor prognosis vs RF negative children. Click now for Health Tip of the Day.